Sri Ramanuja is credited with the first-ever presentation of a systematic procedure of worshipping the Lord. He divided the process into convenient steps and presented it as ‘Nithya grantha’. There have been some more publications after this and those by Vangipuratthu Nambi, Koorath Alwaan, Parashara Bhattar are famous besides the latter-day ones by Vedantha Desika and Manavaala Maamuni. Adiyen had the good fortune of bringing out an English version of Raamaanuja’s ‘Nithyagrantham’ with meanings in English. Also given in that book were ‘Nithyagrantham’ texts in Devanaagari, Telugu and Kannada but the Tamil text was not provided as it was in “Grantham Style”. 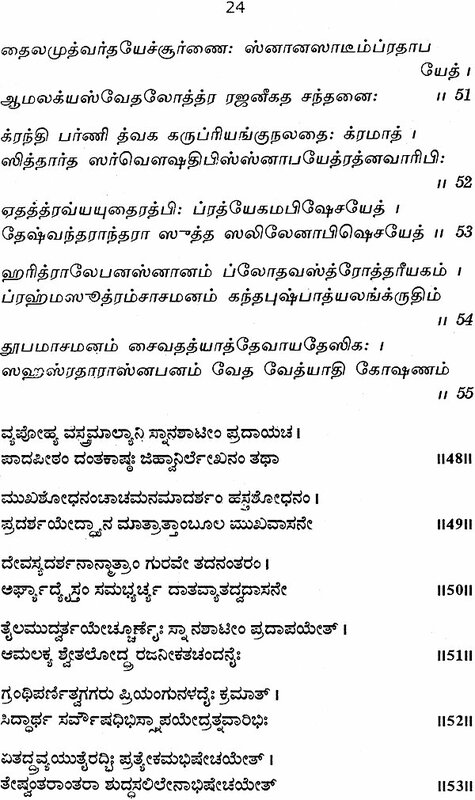 The present book contains two sections, namely the second volume of Nithyagratham in simple Tamil script made out of the text in Gratham Tamil which is not easily followed by many (this is given as Book- 2) and the other, Paraashar Bhattar’s ‘Kriyaadeepam’, For both ‘Kriyadheepam’ and ‘Nithya grantham’ (this is given as Book- 1), Adiyen has provided English transliterations and meanings. Trust the readers will find this contribution useful. The Nithya gratham presented here in simple tamil is in a way an international effort! I have a good friend in Florida, USA, by name Jahannathan and since he is familiar with different languages. I sought his assistance to get the grantham text in Simple Tamil. This was later checked by Smt. Lakshmi Maniappan here. Smt. Lakshmi is conversant with both Tamil and Devanagri. Also utilized was Sri Jagannathan’s familiarity with various software which came in handy in preparing ‘kriya deepan’s’ text in Sanskrit and Tamil. I thank both Sri Jagannathan and Smt. Lakshmi for their contributions and sparing their time for this august cause. Sri A. Narasimhan, son of my elderly friend, the late Dr. N.S. 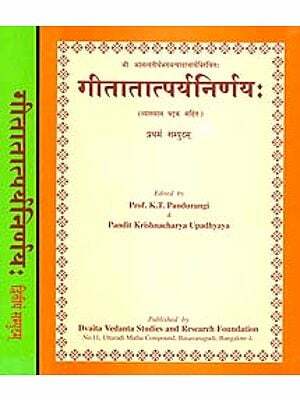 Anantharangacharya, who is himself an upcoming writer, has helped in correction of Kriyadeepam’s Sanskrit text. I thank him for the same. My wife has helped in collating and correcting the texts. I thank Mrs. Sudha for DTP type-setting and Sri Sharada Prasad for printing at short notice. Chi. Kiran has done a good job of designing of the outside cover. I thank him also. The present book is the second publication in the ‘Thiruvaaraadhanam’ series. 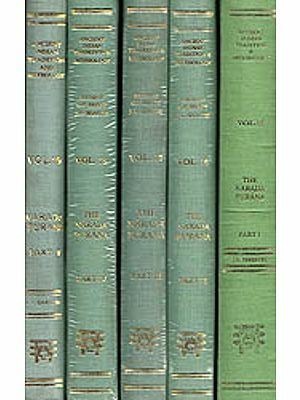 The first volume was on Sri Raamanuja’s Nithyagrantham for which original texts were presented in four languages- Devanaagari, Kannada, Telugu and English. The text in Tamil language, however, could not be presented as it was in gratham tamil: it was felt that it may not serve the intended purpose. 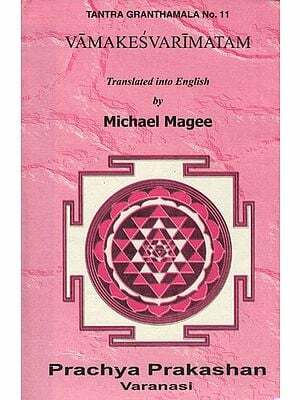 Therefore efforts were made to get it in simple Tamil which is presented here and it is hoped that many Tamil- knowing arradhanam-aspirants will find it useful (given as Book-2). In addition to presenting the Tamil text we are repeating the meaning in English along with the English Text. 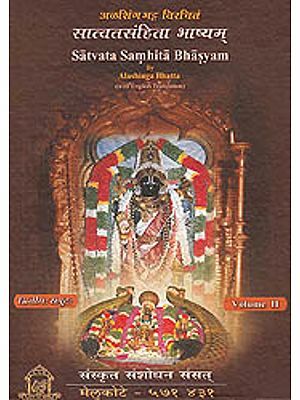 A detailed introduction on Nithya grantham was presented by Adiyen in the first volume. Given here is a summary of the same. In Nithya grantham, which deals with the ritual of daily worship, the starting line reads : ‘atha paramekaanthin bhagavathaaradhana proyoga vakshey’. This means that a paramekaanthin is being instructed in worship. Among the three types of vaishnavas, a paramekaanthin is said to consider all ‘kaarmic’ obligations as kainkarya. This premise gives immence pleasure to the Paramekaanthin and also delights the Lord. The ‘araadhanam’ that is being depicted is ‘baahya’ (external) type, while the other one is ‘maanasika’ type. The external aaraadhanam is action-oriented service comprising collection of required materials and arranging for ‘amishe’ or ‘neivedhyam’ items. Nithyam or Nithyagratham is a handbook for the ‘Ijya’ part of the five-fold duties of a paramekanthin. ‘Thiruvaaraadhanam’ also known as ‘yaaga’ calls for sincere devotion to the lord to achieve the ultimate goal, the realization of which itself owes to His grace. Seeking Him as the ultimate refuge, the araadhana starts and is followed by aasanas described in the book. 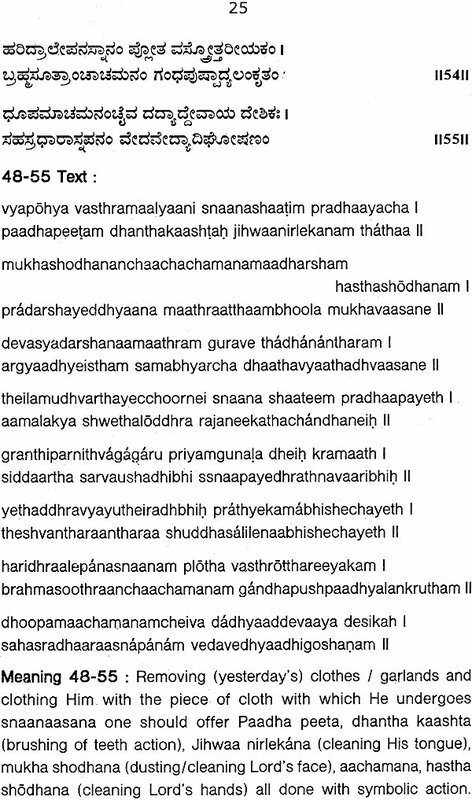 However the Srivaishnavas add a ‘Shaartumurai’ step wherein two paasurams of Thiruppaavai are recited. 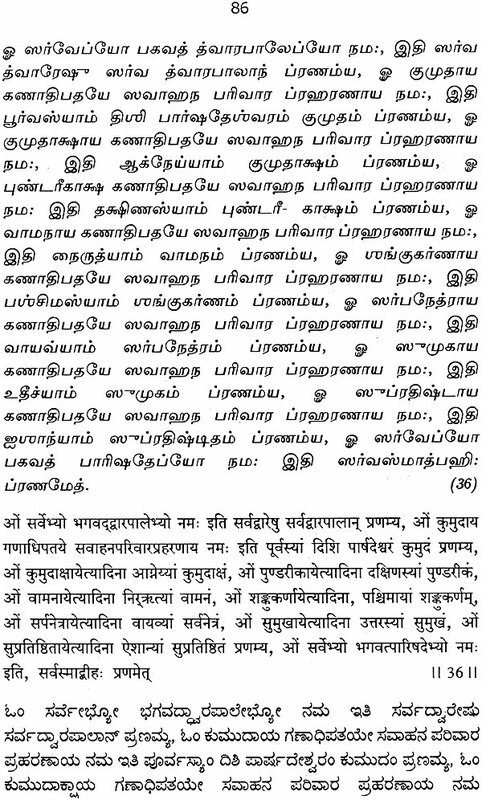 In fact before starting the ‘aaraadhanam’ one recites thirupallaandu, thirupalliyezucchhi and thiruppaavai. Bhattar’s ‘Kriyadeepam’ The first section presents Paraashara Bhattar’s ‘Kriyaadeepam’. The original text for this is presented in Devanaagri, Kannada, Tamil, and English. The meanings for the text are given in English. Parashara Bhattar’s ‘kriyaadheepam’ is one of the half- a- dozen works written by him. Many people are aware of his famous work ‘Sri Gunarathnakosha’ on Sri Mahaalakshmi. His work on Thiruvoimozhi has earned the name ‘Bhattar’s nirvaaham’. Bhattar had the full ‘anugraha’ of Sri Raamaanuja. 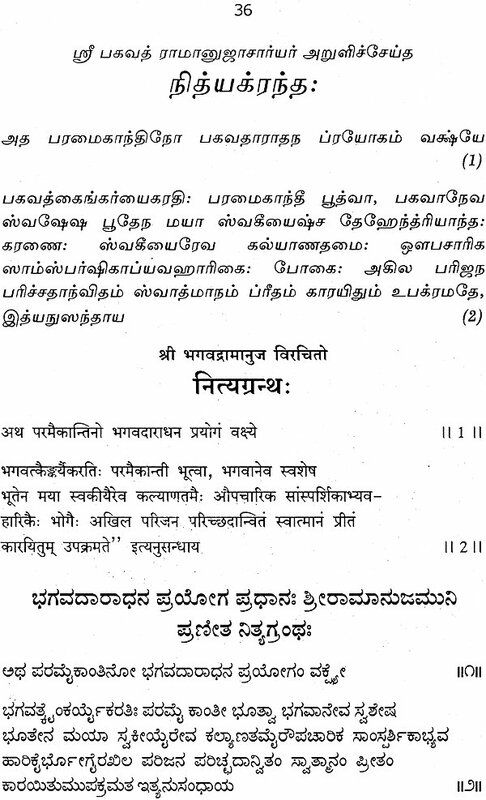 One should note the instruction given, vide step 34, regarding the use of Mani or ‘ghantaanaadha’ in ‘kriyadeepah’. The step 41 is incomplete but its overall import according to one of the Scholars is incorporated in the meaning. It is hoped that freshers who lay their hands on this book will start ‘Thiruvaaraadhanam’ without any further delay.